Some more reviews today, this time a recent Glen Grant. 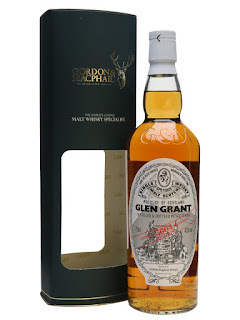 Gordon & MacPhail have a pretty incredible selection when it comes to Glen Grant. They seem to have a bottling for every vintage from 1980-1949! Although not many younger bottlings. This 2004 being the exception. Sherry casks have been favoured in the past, although the distillery seems to be moving towards more of a floral Bourbon style recently. Nose: Malty, fresh Sherry, nutty, toffee, raisin. It’s soft with no trace of youth. Taste: Very soft, malt, young spice, ginger biscuit, raisin, Sherry syrup. Finish: Medium length. A little unbalanced with more oak. This is a nice style of Glen Grant in opposition to the Bourbon style maturation of recent OB’s, just a shame the finish was a little overly oaky.